Dead Run. It’s an ominous name for what is actually quite a lovely stream, though at times this 3.6-mile loop hike can feel rugged and perplexing. The first half is relatively straightforward: nearly two miles of hiking through some of Fairfax County, Virginia’s most peaceful terrain. 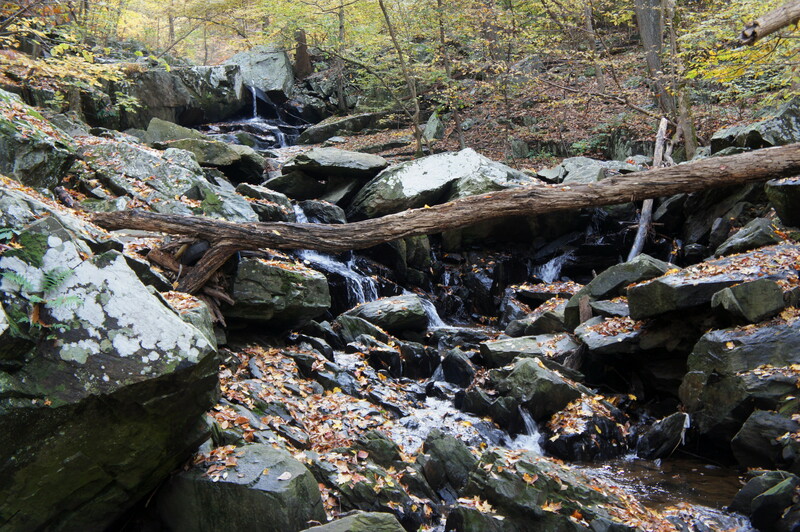 A 1/10-mile section of Dead Run—the highlight of the hike—features a series of modest but interesting waterfalls, and the Potomac Heritage Trail loosely follows the calm and quiet Potomac River. The second half is more challenging—mostly due to route-finding woes—but is likely to be all but deserted. The best place to begin this circuit hike is from the C-2 parking area in the northwest corner of Turkey Run Park, easily reached from the George Washington Memorial Parkway. 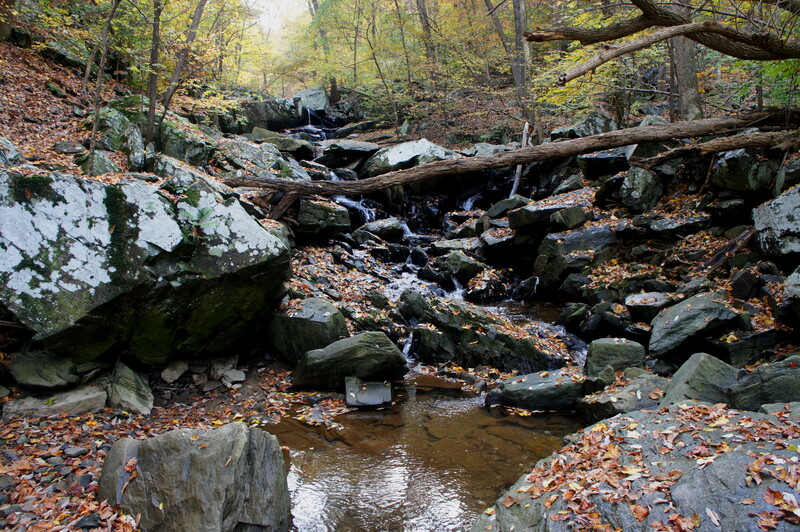 Follow the route—marked by a sign indicating “Potomac Heritage Trail .25 MI”—down a gentle slope to the first trail junction (bear right), after which the path drops steeply down a series of stony stairs. 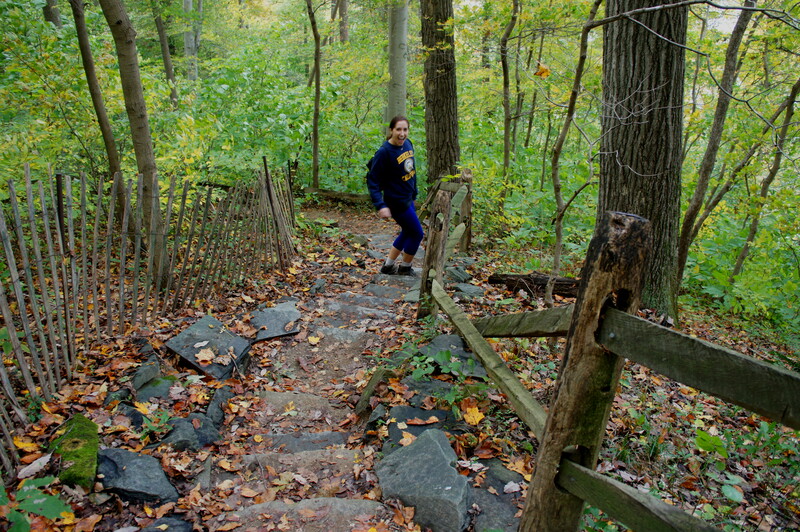 From the trailhead, the route loses nearly 150 feet in the course of ¼ mile, at which point one reaches the Potomac Heritage Trail (PHT), a long-distance route extending—with some interruptions—from Loudoun County to Mount Vernon. Take a left at the fork. After a short level section, the PHT drops sharply down another set of stairs then traverses a particularly scenic section of Turkey Run just before it flows into the Potomac. Cross the creek and climb the steps on the opposite bank, where you soon encounter another fork: stay right on the PHT. For the next mile, the PHT is lovely and mostly level, offering occasional views of the namesake Potomac River. 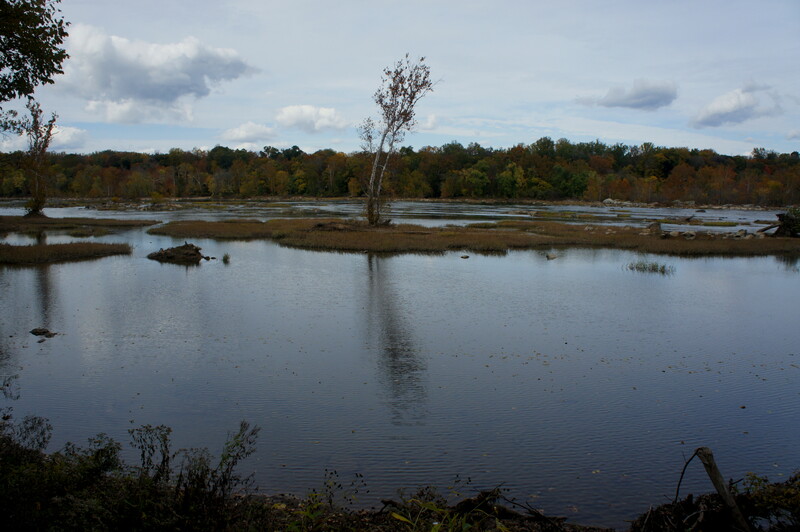 In contrast with sections upstream, the Potomac here is quiet and still, and small, marshy islands dot the waterway. 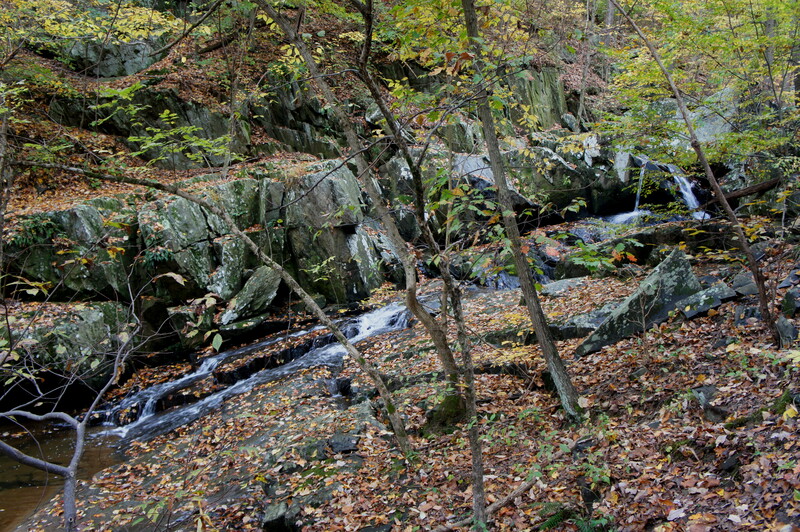 Back on the shore, the PHT weaves through a dense deciduous forest, crossing two rocky streams before encountering Dead Run, marked with a wooden sign after around 1 ¾ miles of hiking. This is where the trail becomes more challenging to follow. Take a left at the sign, following a faint path along the eastern bank. Stay on this path for roughly 30 yards before crossing to the right bank—be careful, the traverse requires some secure footing on potential slippery boulders. Stop halfway through the crossing to take in the view upstream: a lovely tiered waterfall, tumbling down a terrace of greywacke sandstone. Aim for a faint yellow blaze visible on the opposite side. From here, work your way south, following the west bank of Dead Run; sporadic yellow blazes guide the way. A second minor water chute spills into a peaceful pool above the original cascade, making for a nice lunch spot. Soon enough, the slope of Dead Run levels out, and the towering supports of buzzing GW Parkway are visible ahead. Pass fully under the parkway before crossing Dead Run back to the left bank. By now you have hiked roughly 1.8 miles from the trailhead. Here the trail ventures into Langley Oaks Park, although—judging from the lack of signage of any kind—you would hardly know it. 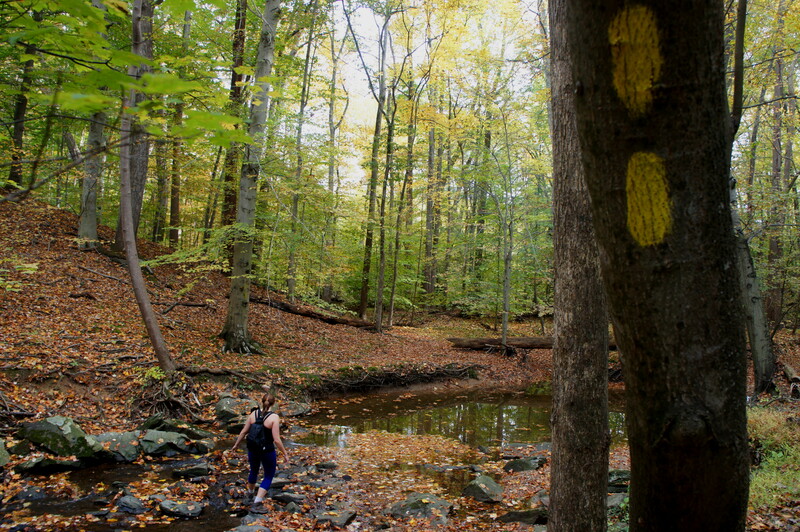 While an established trail exists, route-finding is challenging and requires a keen eye: follow the yellow blazes as it weaves eastward through the forest. With GW Parkway at your back, the route crosses under a set of power lines roughly five minutes after the final Dead Run crossing. Five minutes later, with a wooden fence in sight up ahead to the left, the route forks in three different directions; the intersection is marked by a stake with a pink ribbon. While the most obvious path continues straight, the yellow blazes follow a subtle footpath veering off to the left. Soon enough the trail runs right up against a wooden fence; bear left, following the fence for a short distance before cutting back north. The trail for the next ½ mile is relatively easy to follow, as it weaves around two surprisingly deep-cut ravines; a small wooden plank offers passage over part of the second. 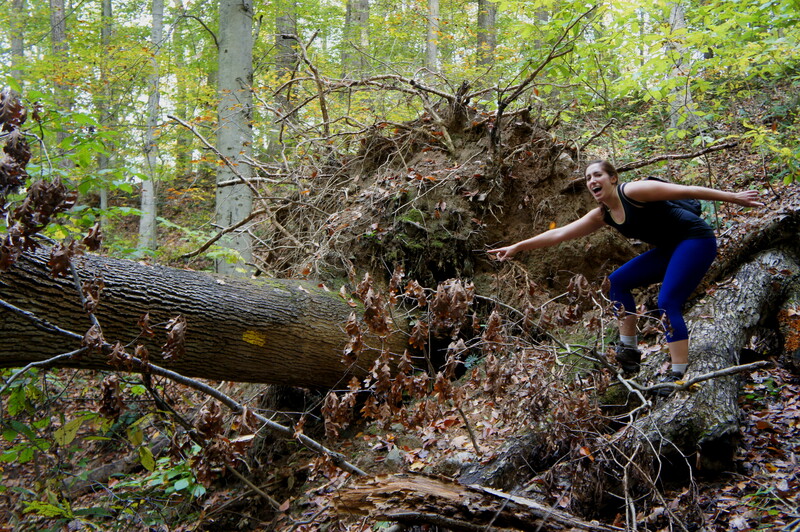 The third ravine, probably the widest, offers the biggest challenge for route-finding, hindered in part by the fact that the only visible yellow blaze is on the hidden back-side of a large downed tree. The most reasonable option at first glance is for the trail to bear right, up the ravine; however, any semblance of a path quickly disappears in this direction. Instead, there is (evidently) a faint track—not at all apparent—leading steeply up the slope to the east to the left of the downed tree; if in doubt, simply climb straight up the hill in an eastward direction. Eventually an obvious trail—cutting north-to-south—will appear; at this point, bear right for around 30-50 yards, after which another yellow blaze leads down the hill to the left. This is the final stretch: the route weaves down a minor ravine, crosses again under the power lines, and edges down to Turkey Run. Head north (left) along the west bank of Turkey Run, crossing the stream just after passing under GW Parkway. A well-trodden path leads from here, through Turkey Run Park, to the parking area in less than ¼ mile, though the elevation gain is more than 100 feet. 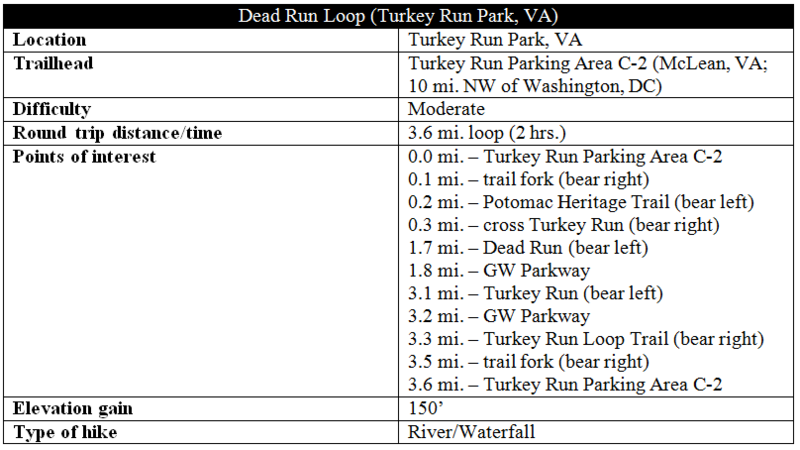 This entry was posted in George Washington Memorial Parkway, Moderate Hikes, Virginia and tagged Dead Run, Dead Run Loop, George Washington Memorial Parkway, GW Parkway, Langley Oaks Park, loop hike, Potomac Heritage Trail, Potomac River, Turkey Run, Turkey Run Loop Trail, Turkey Run Park, Virginia, waterfall. Bookmark the permalink.